Michael Franti & Spearhead chose to make songs that get people laughing and smiling, rather than a protest album, after his trip to explore the conflicts in Iraq, Israel and the Palestinian territories. There he was dancing in his bare feet in the audience at the Talib Kweli show; hanging out stage left during The Music's show; or performing some disco karaoke at the Net Cafe. He also delivered two roaring sets with his band Spearhead, who fit the festival's multicultural vibe to a T. The group's grounding in hip-hop, roots reggae and 1970s funk, combined with Franti's plainspoken songs about social justice, made their performances communal experiences. "All the freaky people make the beauty of the world," a line from one of his songs, became his mantra. There and then, freaky people were the world. A year or so later, Franti was sitting on his tour bus thinking about the war in Iraq, in particular all the talk about its economic and political costs, and he wondered: What about the human costs? "I said to my friend, 'We should go to Baghdad, see what the people's lives are like." Franti is talking by cell phone from San Francisco's Golden Gate Park, where he's busy preparing for the annual Power to the Peaceful Festival. Some will scratch their head at Franti's impulsiveness. Flying into a war zone because you want to see how the people are doing sounds reckless, but a purpose emerged, not to mention an album, a book and a documentary film. "There was no script," he says. "But we didn't want to talk to so-called experts. We wanted to talk to people we met, so the people you see in the film are people I met walking around, or through other people I had met." As he demonstrated at Fuji, Franti is a natural mingler. In the film, which is called "I Know I'm Not Alone," the big singer walks around Baghdad with his acoustic guitar, using his music to break down intercultural barriers that have become more resistant since the invasion. Children flock to him. Adults are more wary, but he charms his way into homes, hospitals and shops. The people he meets talk freely about themselves and the war. The film provides little insight, but it conveys the frustration that is festering on both sides of the cultural divide. "The [Iraqi] people I met were extremely friendly, and they really wanted their story to be told to the world," says Franti. "As for the U.S. soldiers, there's signs when you enter the Green Zone that say no cameras at any time." Nevertheless, the most dramatic scene is Franti's performance in front of a group of American soldiers. He sings "Bomb the World," whose chorus goes, "You can bomb the world to pieces, but you can't bomb it into peace." "After I sang that song I thought they would shoot me," he said. "But they came up and said, 'You got big balls to come here and sing a song like that.' A few told me, 'We believe in what we're doing. We're trained to do whatever our government asks us.' But the majority told us that before they got there they believed Saddam Hussein caused 9/11 and that there were weapons of mass destruction. They found out those were lies and they just wanted to go home." Franti admits he wasn't sure how to handle it. "I visited a hospital to see children who were missing limbs, and later that day I went to a place full of soldiers who might have been responsible for what happened to these kids. It was hard for me to sit there and laugh with them and be nice. I was angry, but a friend of mine said before going in, 'Don't interview them, just be with them.' And that's what I did." Franti followed up his Baghdad trip with a journey to Israel and the Occupied Territories. "I went there to listen to as many voices as I could on the Israeli side and the Palestinian side, just to see what was going on. Basically, you have one group of people who are modern -- first-world economy, shopping malls, movie theaters -- and then you have Palestinians who live in a third-world environment, very impoverished. They live under a military occupation. Every day they have rifles pointed at them, rifles fired at them. As a result, some of them formed a resistance, and in many cases this resistance took the form of suicide attacks. Everybody lives in constant fear. The violence just keeps pushing people to greater extremes." It was at a checkpoint in Israel that he felt the most uneasy. "We weren't allowed to use cameras. Tempers flared and there's this 19-year-old [Israeli soldier] who isn't very grounded, but has a rifle in his hands. That was really scary." Through interviews Franti had with people on both sides, as well as encounters with fellow musicians and an amazingly concise explanation of the Israeli soldier's lot from a former soldier, it's not difficult to draw the conclusion that, some years down the road, Baghdad could look a lot like the Occupied Territories: a bloody stalemate between people with modern weaponry and people with homemade bombs. "I Know I'm Not Alone" has been shown at film festivals and is available on DVD. A version with Japanese subtitles is being prepared. Franti is also writing a book about his experience. "The film is told through the eyes of people I interviewed," he says, "but the book is my own take on things." The same could be said about "Yell Fire," the new Spearhead album, though Franti says it has a slightly different purpose. "When I was in Baghdad playing music for people on the street, I sang political songs," he recalls. "They would say, 'Don't play songs about war. We want to hear songs that make us laugh and smile.' And that's what I wanted to do with this album, not to make 14 angry songs telling the president to go to hell, which I could have easily done." Recorded in Jamaica with the legendary production duo Sly Dunbar and Robbie Shakespeare, "Yell Fire" is no less confrontational than past Spearhead albums. Franti has always been politically minded. He started out with the underground collective The Beatnigs in 1987 and in 1990 formed the Disposable Heroes of Hiphoprisy, in which he adopted the flow of Public Enemy's Chuck D and the revolutionary attitude of Gil Scott Heron. At the time, black audiences heavily into hip-hop were said to be cool to Franti's raps, which rejected gangsta cliches for diatribes on AIDS, the death penalty and the capitalist mind-set. "Yell Fire," with its mix of reggae, funky R&B and standard rock, takes Franti even further from his stylistic beginnings. "I never said I was just a hip-hop artist," he says. "I'm a musician who loves all forms of music, and it's reflected in the work I do. When I started I didn't know how to play any instruments. Over time I've taught myself guitar, piano, drums. I love hip-hop but I'm just as influenced by reggae or rock or soul." His sociopolitical outlook was influenced by something different. Franti was adopted as a baby by a white couple who already had three children of their own. "My father is black and my mother is white. The reason they gave me up was that they weren't married and my mother thought her family would never accept a brown child. So from the second I was born, racism was a factor in my life." 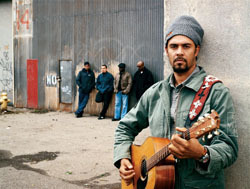 Rather than being bitter and defensive, Franti has channeled his experiences into an appreciation for diversity, as well as a firm belief in the power of communication for good. He's reminded that during a particularly boisterous set at the 2003 Fuji Rock Festival he told the crowd, "You don't know how good it feels to get out of the U.S. for a while." "Three years ago, America was just getting into the war in Iraq," he explains, "and the mood was so nationalistic. Everybody was like, 'Yeah, let's go over there and bomb the s**t out of the country.' I felt alone, like I was the only person who thought we should try to use every form of dialogue first. That's why I named the film 'I Know I'm Not Alone.' I traveled the world and saw I was not the only person who felt this way. It was important for me at that time, because in America I'd take the stage and get booed for speaking out against the war. But now the climate is different. People have changed their attitude." >Michael Franti and Spearhead: Oct. 4, 7 p.m., Club Quattro, Osaka, 6,500 yen ( 6535-5569); Oct. 5, 7 p.m., Liquid Room, Tokyo, 6,000 yen ( 3444-6751).